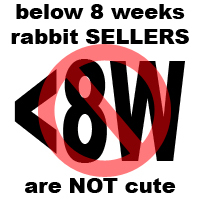 Stop Buying Under Age Baby Rabbits! 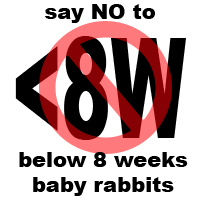 I am still getting question like “what can I feed an under age rabbit to save it?”. I know we are all very concerned pet lovers but let’s stop and take a look at the bigger picture and ask ourselves, HOW MANY CAN WE SAVE and SHOULD WE SAVE? 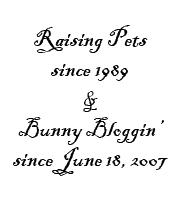 WE MUST ADDRESS THE ROOT OF THE PROBLEM – WHERE THE BUNNIES CAME FROM! Greedy people are taking advantage of the sympathy and compassion of pet lovers. We always think that “PERHAPS IT WILL HAVE A CHANCE TO SURVIVE UNDER MY CARE”. I am not doubting your ability to save another bunny’s life but I hope you can stop encouraging greedy people by NOT supporting their irresponsible act. “When the buying stops, the killings will to” is a very common tagline we hear these days. We ask ourselves how many sharks has been killed for their fins and in fact some shark species are threatened to the brink of extinction. Will you buy a giant tank, fill it up with salt water and save every single shark out there without fins? So with that, I would like to urge everyone to “SAY NO” when it really matters! This campaign runs every single day! P/S: Please feel free to use these <8W pictures on your website/facebook/blog in support of this cause!